Share your excitement of having a go at the daily jackpots at Loony Bingo! The best bingo site in the UK gives you the chance to win a jackpot every day! Seven Days, Seven Jackpots! Sounds bonkers, but you’ll definitely go loony here! Win big on every day of the week at 9pm. Fancy cash winnings? Enjoy seven exclusive days of guaranteed jackpots. If you’re having a bad and difficult day, you could shed off your blues and get started with a boost! The different bingo rooms: Tuesday Special, Share the Wealth, Treasure Tove, Cash Stash, Seeing Double, Saturday Fever and In For A Penny will have you squirming in your seats. The best part is that you could pre-buy your tickets so you never miss a game and a win! Win a great deal of cash in the Self-Made Millionaire Jackpot room every third Saturday of each month! The 75-ball room is available to funded players with tickets at £1. On a different amount of calls you have a guaranteed prize in this room. £1,000 for 35 calls and over, £100,000 for 25-29 calls and 1-24 calls for £1,000,000! 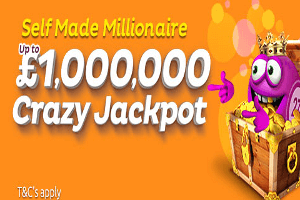 Check out the Guaranteed jackpot bingo rooms, like Bingo Multiplier and Pay Day Bingo. Here you stand a chance to win a great chance to win tremendously big bingo prizes! Grab your mumbo jumbo prizes here that will overly satisfy your winning cravings! In both rooms, you have a mega bingo jackpot of £10,000 with guaranteed winners in every game!